Financial Elite – The global financial elite – including members or representatives of the Rockefeller, Rothschild, and Morgan families – hold secret meetings and make important decisions in closed groups such as the Council on Foreign Relations. These plans are then implemented throughout the world, further consolidating material wealth and control. Bank for International Settlements – The BIS is the central bank of central banks based out of Basel, Switzerland that is controlled by the financial elite. It has 55 member central banks but is mainly run by bankers from the United States, England, Germany, Switzerland, Italy, and Japan. It operates with little transparency and is not accountable to national governments even though it has significant control over the global financial system by setting reserve requirements, the amount of money in banks around the world must have on reserve. International Central Banks – Central bankers use the World Bank and the International Monetary Fund (IMF) to make more money while exploiting the resources of countries they lend to – bankrupting them in the process. For every dollar the US contributes to these banks, US Corporations – such as Halliburton, Exxon Mobil, and Bechtel (controlled by the economic elite) – receive more than double that amount in contracts from these international banks. National Central Banks – Almost all countries have a central bank (see the list here), of which commercial banks are members. Central banks set interest rates and determine the amount of money in circulation. 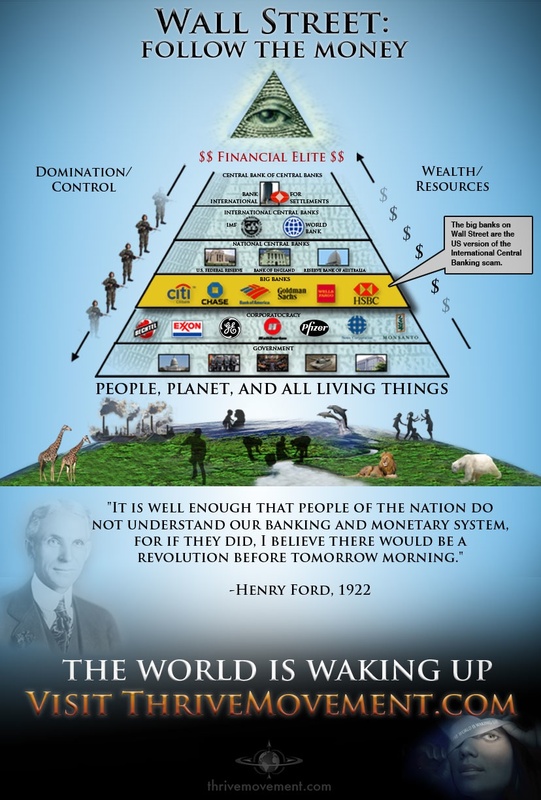 They also lend to governments at interest, putting them above the lower four levels of the pyramid. Big Banks – Big banks offer corporations loans at special rates, allowing them to do business. This puts banks in a powerful position, above corporations and the rest of us, because funding is what allows the corporations to go forward with their projects. Corporatocracy – Corporations fund political campaigns and influence politicians through lobbying. Many are now bigger than entire national economies, putting corporations above government. Government – Government is largely funded through taxpayer money, putting it above the people. If it wants to borrow extra money it must go to a Central Bank. People, The Planet, and All Living Things – At the bottom level of the pyramid is the majority of people on this planet and all other life. As of 2010, one in every seven people on the planet did not have enough to eat and most ecosystems were suffering. 2. Thrive: What on Earth will it take?